National Instruments has released its new PXI FlexRIO architecture that enables customised modular platform hardware development. National Instruments (NI) has announced a new PXI FlexRIO architecture that integrates mezzanine I/O modules with Xilinx Kintex UltraScale FPGAs. The first wave of products based on this new architecture includes two high-resolution PXI FlexRIO Digitisers, three dedicated PXI FlexRIO Coprocessor Modules and a module development kit that helps with custom front-end development. The FlexRIO product line combines customisable I/O and user-programmable FPGAs into high-performance, reconfigurable instruments users can program with the LabVIEW FPGA Module. With Kintex UltraScale FPGAs, the new FlexRIO architecture offers more programmable resources than previous Kintex-7-based FlexRIO modules. In addition, the new mezzanine architecture fits both the I/O module and the FPGA back end within a single, integrated 3U PXI module. For high-speed communication with other modules in the chassis, these new FlexRIO modules feature PCI Express Gen 3 x8 connectivity for up to 7 GB/s of streaming bandwidth. * Digitiser Modules – New PXI FlexRIO Digitisers deliver high-speed sampling rates and wide bandwidth without compromising dynamic range. The PXIe-5763 and PXIe-5764 provide 500 MS/s and 1 GS/s sampling rates, respectively. Both modules offer 16-bit resolution and up to 400 MHz of bandwidth on all four channels. * Coprocessor Modules – Add real-time signal processing capabilities to a system with dedicated Kintex UltraScale PXI FlexRIO Coprocessor Modules. A chassis full of these modules delivers the highest density of computational resources per U of rack space of any NI system. * Module Development Kit – Start with a FlexRIO FPGA back end programmable by LabVIEW and then design custom I/O modules to meet more unique application requirements. 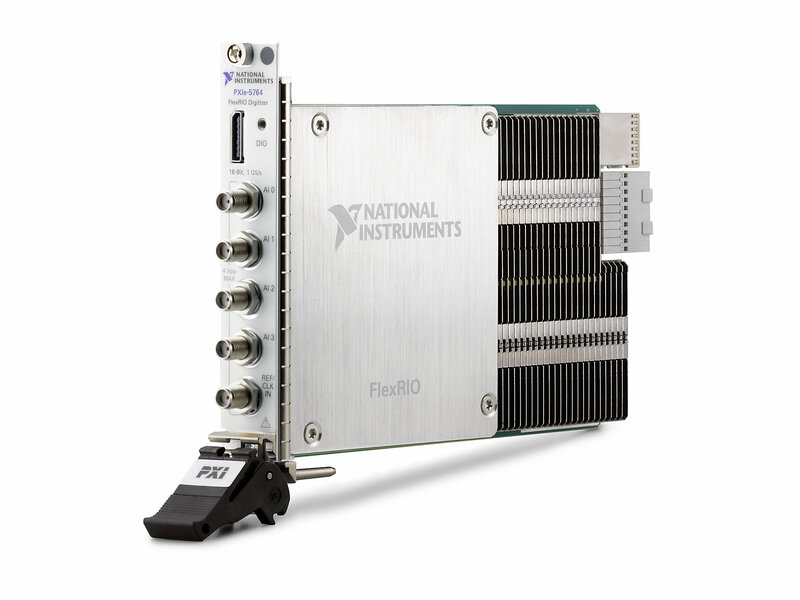 FlexRIO instruments are an important part of the NI portfolio that engineers can use to build smarter test and measurement systems. These systems benefit from more than 600 PXI products ranging from DC to mmWave and feature high-throughput data movement using PCI Express bus interfaces and sub-nanosecond synchronisation with integrated timing and triggering. Supported by a vibrant network of partners, add-on IP and applications engineers, the NI platform helps dramatically lower the cost of test, reduce time to market and future-proof testers for tomorrow’s challenging requirements.